This magnificent Bayliner 4588 Pilothouse Motor Yacht features a large fly-bridge, covered cockpit, spacious salon, pilothouse, office, and two staterooms to insure room, comfort, and convenience. Whether you are planning a day on water, a weekend getaway, or a cruise to the islands this 45' Bayliner is ready to accommodate with classic style and modern accommodations. on either side. Aft of the bridge seating is home for the tender with an electric dinghy davit for easy launch and retrieval. The forward stairway leads below to the pilothouse and a ladder aft connects with the covered cockpit. The pilothouse features a full lower station with twin navigation systems and full controls. An L-shaped lounge with table sits behind the helm and shares the view. There are doors to either side leading to side decks and forward access. The large fore deck has stainless steel bow rails, fender racks, a bow pulpit with anchor and electric windlass, and a fore deck guest lounge. From the pilothouse house you can also access the fly-bridge or a few steps down to the main salon. The large salon is bright, airy, and inviting. Rich woodwork, custom window treatments, and carpeting provide a comfortable living area. The salon features an open galley just aft of the pilothouse. The galley is well equipped with teak cabinets, solid surface counter tops, hot and cold water, stainless steel sinks, a rubbish compactor, a range with a full oven, a microwave oven, and a refrigerator with freezer. A large wrap around dinette is aft of the galley. To starboard is an extended entertainment centre with a dedicated ice maker, liquor cabinets and DVD/TV, along with two chairs and a table. A sliding door gives access to a covered cockpit that provides an area to handle lines, do a bit of fishing, or relax in private and enjoy an drink. The transom door opens to a swim platform with boarding ladder. There are two staterooms, both with wall mounted DVD/Televisions. The master stateroom is forward an features an island berth, mirrored bulkhead, hanging lockers, and en suite head compartment with basin, bathtub & shower. An attached office features pocket doors, a writing desk, and twin bunks, perfect for children or grand children. The guest stateroom is on the port side with a double berth and private head with shower across the hallway. This 4588 is equipped with twin turbo-charged Hino 240-hp diesel engines designed to provide long-lasting dependable diesel power yet sustaining unbelievable fuel economy. Mechanical features include a 12kw Westerbeke generator, reverse cycle ducted air conditioning as well as ducted heating throughout the vessel. Laundry with washer & dryer, and a central vacuum system. 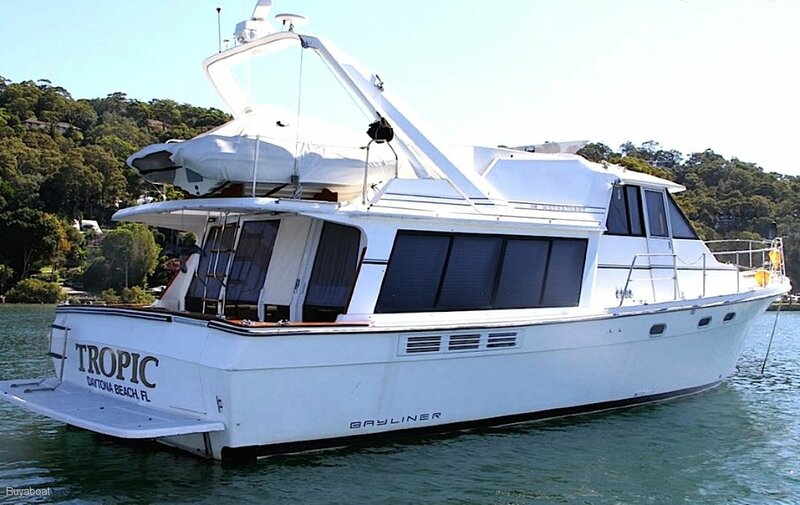 She is well equipped with room to spare as a vacation getaway or even as a live-aboard. Full modern Galley Port Side, with Teak Cabinets, Solid Surface Counters, Parquet Floor, Dual Stainless Steel Sinks, Nutone Blender, Three-Burner Range with Full Oven, Microwave Oven. Yes heated by engine. And power. Fusion sound system with separate amplifier(Includes Ipod & Iphone Insert) connected to 10 Speakers throughout vessel. Yes climate controlled ducted, cooling and heated. Electric anchor, plough anchor and chain. Life jackets, life ring, 4 fire extinguishers, fire blanket, flares. 30-amp Shore Power, Laundry with Washer & Dryer, Central Vacuum System, Jabsco permanently plumbed electric oil change pump connected to both engines, Spin off fuel/water separators & spin off oil filters. 'Tropic' is a lot of boat for a great price, features live aboard comfort and elegant cruising, including accommodation to sleep six, a spacious salon and a full galley. The separate pilothouse features a fully instrumented helm with the latest electronic equipment. Call Glenn on 0414 988 273.